Your follow up is incredible!!! Thank you! 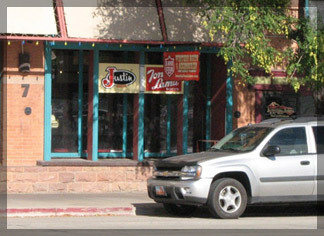 LONESTAR BOOTS store services the local community and many visitors of Moab. The store is located in the historic Cooper-Martin Building on 7 North Main Street. With name brands of quality boots in stock, including Justin, Tony Lama, and Twisted X, the store provides a wide range of styles and sizes to meet your needs. For those that need safety footwear, a line of sturdy work boots including steel toes are also available. Guy Agee, the owner of Lonestar Boots, has extensive knowledge of the boot and western wear industry. He worked his way through college at a western wear store and continued in this industry at Tony Lama. At Tony Lama he held numerous positions from design through manufacturing. He later returned to retail where he managed a western wear store in Lubbock, Texas for 15 years. With more than twenty five years of western wear experience he looks forward to meeting the needs of Moab and the rest of the country at Lonestar Boots. Available to the clients of Lonestar Boots are accessories that include western belts, hats, and unique handmade jewelry.